Mayor Berger talks about civil rights, youth and the EPA at Rotary. Lima Mayor David Berger's annual State-of-the-City speech fell on Martin Luther King Day and he began by recommending two books we should read: the biography of Ulysses S. Grant written by Ron Chernow and the biography of Frederick Douglass written by David Blight. "We need to know that history because those same kinds of civil rights can be lost again. So on a day like today when we can certainly herald the man and the civil rights movement we need to understand the context was real and affected lives of people in our community and across the nation in ways that truly were not our best days as a nation." Berger also explained the recently created Youth Commission. It is comprised of agencies, governments and individuals who are working together to improve the lives of youth in our community. "We continue to see the suicide rate among young people. We continue to see children who are being placed in foster homes because parents have died as a result of the opioid epidemic. We continue to see the effects of children who are being raised in households where there is violence. We as adults have to step in. We have to intervene. We have to create other ways for these children to have lives that are healthy, where they are motivated to seek excellence, where they are motivated to do well and be well." 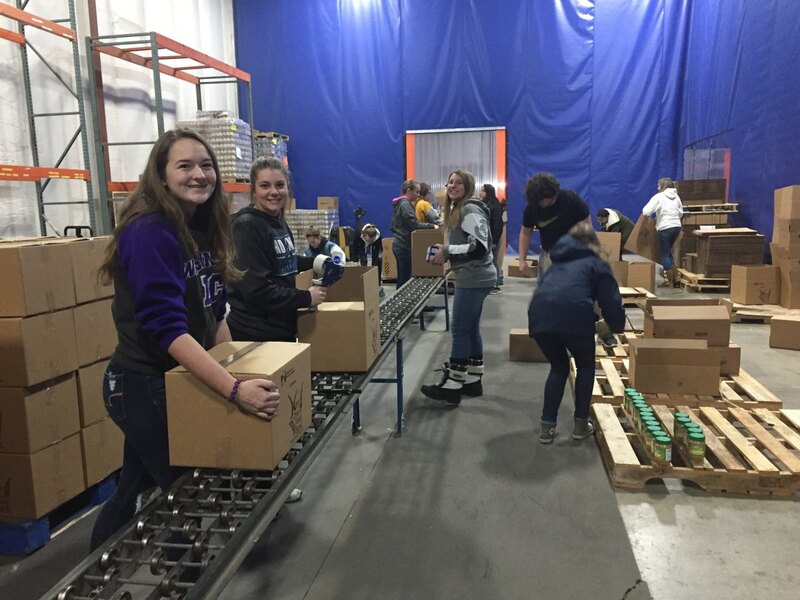 The Youth Commission is going to begin with pilot programs next school year at North Middle School and St. Gerard that will offer enrichment activities and mental health resources. He hopes to expand the program to every neighborhood in the city. Berger was very pleased to see congress pass and the president sign revisions to the Clean Water Act that would allow communities to prioritize compliance with EPA mandates to deal with their most pressing environmental concerns and budget constrictions. Nearly as long as he has been in office, Berger has been fighting EPA mandates that would have cost the city hundreds of millions of dollars. "It's important for cities to set priorities, decide what we will do and we're going to postpone." Berger said he was surprised at how little fanfare there has been about the new work at the Join Systems Manufacturing Center. He credits Task Force Lima with advocating for the future of the plant on the state and national levels. "There's in excess of $100 million being spent in that plant. There are hundreds of millions of dollars of product contracts now in place. We went from roughly 400 employees two years ago, we're at 600 now and on our way to more than 1,000. A terrific upturn that will last." Cornerstone of Hope is helping people with mental health issues. Invite a friend or colleague to a meeting. Attend a different club and bring back some new ideas. Attend a Rotary social hour and make a new friend. Get involved in a new committee. Surf the Rotary world through the website and be inspired about Rotary at the local, district and international levels. Nate Gast of Custom Audio Concepts donated a remote car starter and its installation. Thanks to Larry Webb for his $200 purchase! The Rottery drawing today was to the benefit of PolioPlus with club member Mike Schoenhofer winning the drawing. Esther Baldridge is looking for a couple more judges for the 7th and 8th grade Essay and Speech Contest. Thanks to the ten Rotary members who donated blood at last week’s drive! Mike Swick of Lima Memorial Health System presented a check for $9,198 to Lima Rotary Foundation Board Chair Elizabeth Brown-Ellis. They both thanked the club members who donated their time to man the November 3rd blood clinic. Mike also reflected on how important the blood clinics are to the community as an affordable way to know your health statistics. Over 1,000 people participated in the two clinics last year. President Paul Swartz presented a check for $2,079 to club member Bob Ruehl for his upcoming trip to Honduras. He spoke of how the upcoming Rotary International sanitation project is costing $200,000 and has been 4.5 years in the works. The relationship and trust that has been established with the Rotary Club down there is very important to completing this project. Scott Cockerell was inducted into the club as a new member. Sponsor, Andy Wannemacher introduced Scott to the club. Scott is the Vice President of Operations at Wannemacher Total Logistics and joined that firm in 2009. Cornerstone of Hope Christian Counseling’s Executive Director, Kari Taylor was the guest speaker. Their Lima office was established in 2014 and brought to our area faith based mental health services that were sorely lacking. They now have a satellite office in Bluffton. Grief and coping counseling is their specialty and all their counselors are licensed. Connecting with schools has been an important part of their outreach through Resilient Kids and Teens Programs. Kari mused about being labeled the Lego Lady as they use Legos in the schools as they teach kids about communicating and expressing emotions. She views their collaboration with the mental health board as an important partnership. In taking the pulse of our community they have found a severe issue with anxiety and depression. Their solution to this is formation of support groups where people can share practical coping skills. They are available for business and group trainings and workshops on a variety of subjects. She invited people to visit their website at www.cornerstoneofhope.org and view the wide range of counseling services they offer. Also look for them on Facebook. 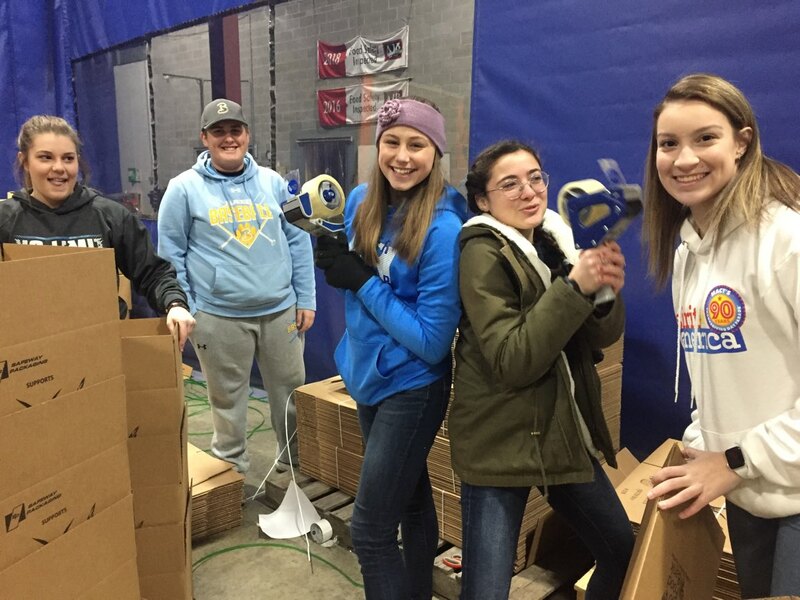 Our Bath High School Interact Club honored Dr. Martin Luther King, Jr. with a day of service. 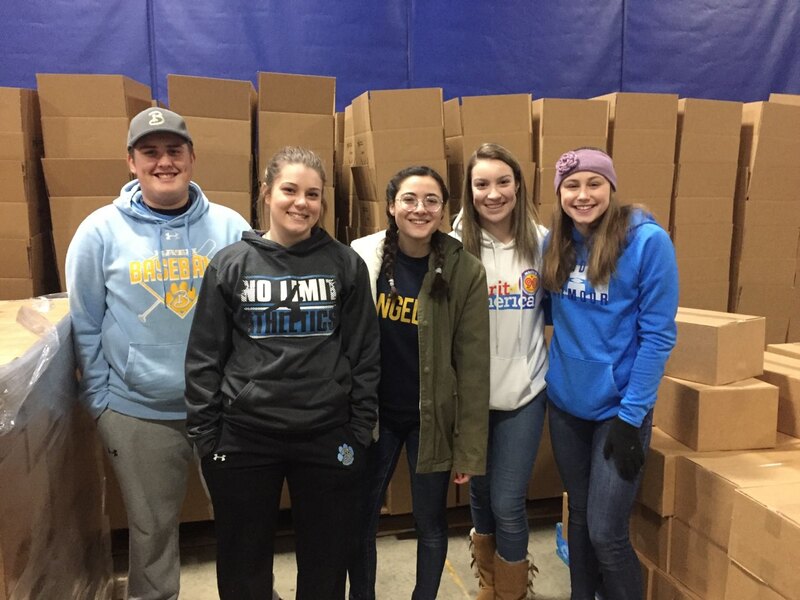 Our Bath High School Interact Club volunteered at the West Ohio Food Bank in celebration of Martin Luther King Day of Service as a "day on, not a day off" school. 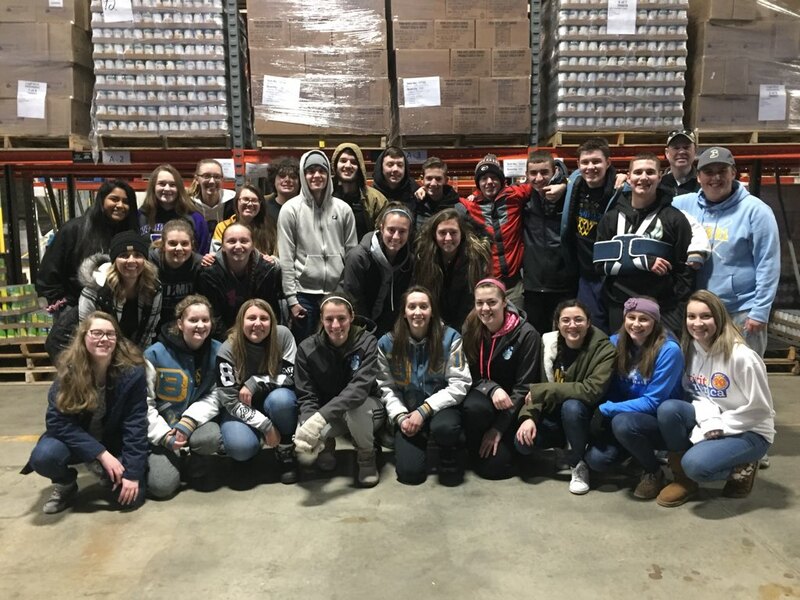 They helped build senior boxes for individuals 60 and older at 130% of poverty and sorted donated food to ensure the safety of products distributed through pantries and food distributions. 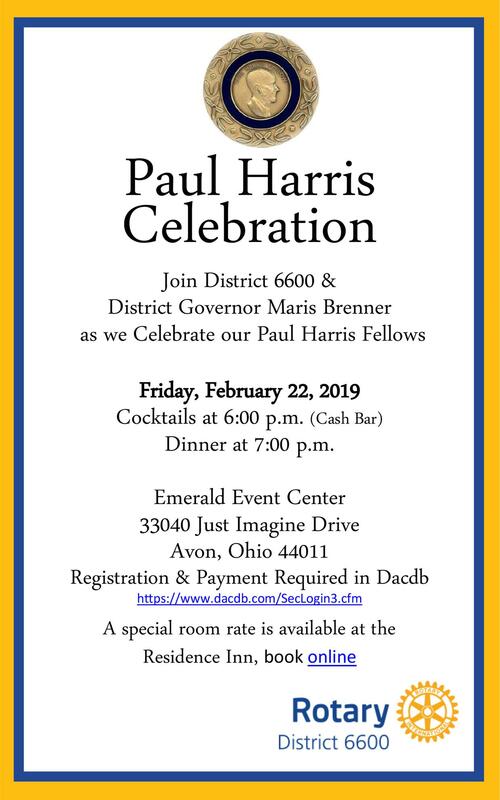 Register now for the District 6600 Paul Harris Celebration Dinner. The Paul Harris Celebration Dinner takes place on Friday, February 22nd at the Emerald Event Center in Avon, Ohio. This will be a wonderful evening celebrating the world changing generosity of members around our District. Cost is $35/person or $60 per couple. It will be a fun evening of fellowship and I am told that Paul Harris will be on stage sharing his own visions and stories and how it all began. Consider filling a table of 8 to 10 for your club. If you bring a table it will be just $30 per person. And, please know that all Paul Harris Fellows who have earned a Paul Harris Fellow or achieved their PHF + levels this past two years will be recognized and celebrated. In fact, if you have not received your PHF yet this year and will have qualified by January 30, 2019, YOU will receive your PIN at this District wide event. We're already planning next summer's Movies in the Park and we need your help to make the season a success. Download the Movies in the Park sponsorship flyer. A concerted effort is being made to eradicate polio by 2023.